Two men who tried to get into Islamic State-controlled Syria have been found guilty of preparing terrorist acts. 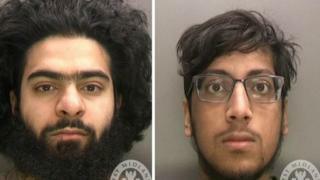 Hanzalah Patel and Safwaan Mansur, both 22, were arrested at an Istanbul hotel in June 2017, after contacting a US agent posing as an IS sympathiser. Birmingham Crown Court heard the pair, who denied the charges, claimed the talk was just "thoughts and banter". The jury returned its verdicts after less than an hour of deliberation and the pair will be sentenced on 25 April. The court heard Patel, of Frederick Road in Leicester, and Mansur, of Hampton Road in Birmingham, first travelled to Istanbul in 2016, with the aim of getting into Syria. They returned home after a contact failed to answer calls but went back the following year. The court heard in May 2017, Mansur was in contact with a user of the encrypted messaging site Telegram - who was in fact working for the US government - to discuss crossing the border into Syria. A search of their luggage revealed camping equipment and outdoor survival gear, the court heard. Patel said he wanted to go there to "big myself up" on returning after taking some pictures and talking to local people.